Published: Oct. 22, 2017 at 01:45 p.m.
Green Bay Packers cornerback Davon House intercepts New Orleans Saints quarterback Drew Brees in tight coverage. 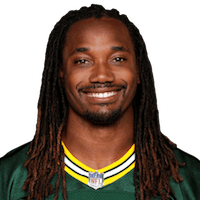 Published: Sept. 21, 2014 at 01:54 p.m.
Green Bay Packers cornerback Davon House intercepts Detroit Lions quarterback Matthew Stafford. Published: Oct. 21, 2013 at 06:28 a.m.
(11:15) (Shotgun) B.Weeden pass incomplete deep left to J.Gordon (D.House) [M.Daniels]. Published: Oct. 21, 2013 at 04:24 a.m.
(9:40) (Shotgun) B.Weeden pass short left intended for D.Bess INTERCEPTED by D.House at GB 33. D.House to GB 44 for 11 yards (D.Bess).